As of October 27, 2015, all society booths have been reserved. If you are interested in a booth, please get on the waiting list in the event additional booths become available. Contact Rodney Juell at rajuell@gmail.com. 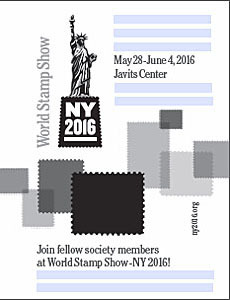 This page features news for and about all philatelic groups taking part in World Stamp Show-NY 2016. To participate, we ask societies to contribute at one of three levels: Patron ($1,000), Organizer ($500), or Sponsor ($250). It is requested that each society minimally join at the $250 level, even if sharing a booth. Please contact Rodney Juell if you have any questions or concerns. It is anticipated that larger societies will join at the Patron level, while others will take part at the Organizer or Sponsor level. “Super Booths” measuring 20x10 foot formed from two adjacent booths are available on a limited basis for $2,000. 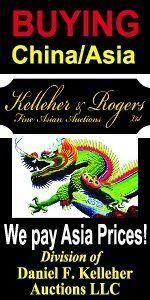 Please inquire if interested. A minimum $250 deposit reserves a booth, with the balance due by January 1, 2016. Booth location and meeting room reservations will be based on the level of participation and then on a first come basis. 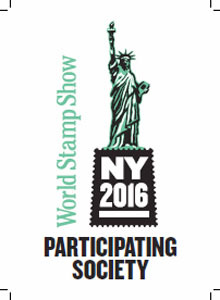 Click the image below, fill out and print this PDF booth request form, send it along with a check made payable to “World Stamp Show- NY 2016." Societies with booths may also request meeting rooms by filling out the meeting request form and emailing it to Rodney. Societies not reserving a booth may also apply for meeting rooms to be allocated on an availability basis once all booth holders have reserved their rooms. Questions may be sent by email to Rodney Juell, Society and Affiliates Chair, at rodney.juell@ny2016.org. 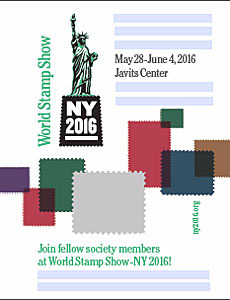 Participating societies are encouraged to use these camera-ready print ads to promote their activities at WSS-NY 2016. Available in black and white or color, they come in three sizes as a customizable PDF, allowing for extra text to be added as needed, as seen in light blue here. Click the size and type needed below. Show design chairman Niko Courtelis would be happy to customize your ad by including a society logo, additional text, etc. 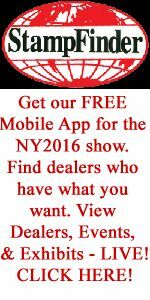 Contact him at niko.courtelis@ny2016.org for assistance. Also available is a 5x7 inch “Participating Society” placard to proudly display at philatelic events. It conveniently fits into a small clear plastic self-standing picture frame. We’ll be providing these to groups when we see them at upcoming shows, but you may also download one here.